Mega Man blasts his way into the third dimension in an amazing new adventure. 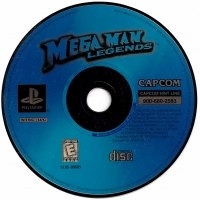 Mega Man Legends combines the best of classic Mega Man action with enormous bosses, a riveting storyline and all the depth of the hottest RPG. Explore vast 3-D worlds in your quest to find the treasure of all treasures, the Mother Lode. You'll love the new 3-D graphics, deadly weapons and non-stop action... unless of course, you're a boss. 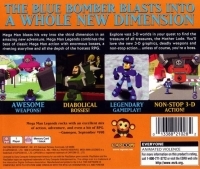 03-25-2012 scott Box Text The Blue Bomber Blasts Into A Whole New Dimension Mega Man blasts his way into the third dimension in an amazing new adventure. 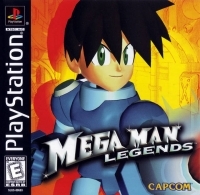 Mega Man Legends combines the best of classic Mega Man action with enormous bosses, a riveting storyline and all the depth of the hottest RPG. Explore vast 3-D worlds in your quest to find the treasure of all treasures, the Mother Lode. You'll love the new 3-D graphics, deadly weapons and non-stop action... unless of course, you're a boss. This is a list of VGCollect users who have Mega Man Legends in their Collection. This is a list of VGCollect users who have Mega Man Legends in their Sell List. This is a list of VGCollect users who have Mega Man Legends in their Wish List.